Welcome again to another ToySoldierChest review! 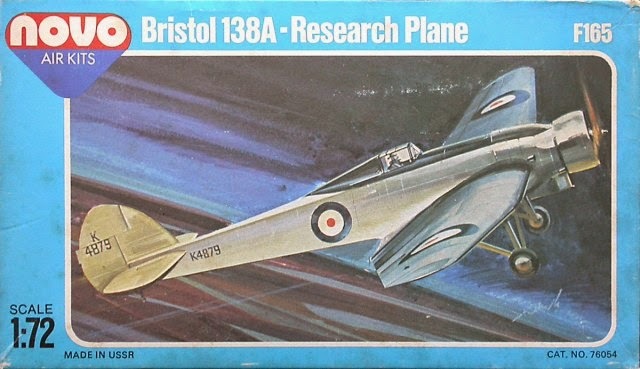 today, we'll review a model kit classic, the Frog Bristol 138 A. A very unusual box to say the least, where the people gets more focus than the model itself. Frog did give extra figures in some model kits, like the Fokker Southern Cross, but this was not going to be the case, so the box ends up looking rather stupid. The pilot figure given is slightly different, but the only difference between the early standard frog pilot is that he is wearing a bucket on his head, a extremely poor depiction. With this ilustration, you get better the feel of the airplane and what you are buying. A quite energic and powerful artwork, it looks like if it is being used as a nightfighter. Finally, the last is very fitting for model kit reissued by it's third manufacturer, just a faded copy of the previous one. It has certainly a pop art 1930's feel, though. Yes, the kit. This is the only 1/72 kit of this model, so you'd better like it :) . It is not bad, a standard middle age Frog kit, not as crude as some of the first ones, but not as detailed as the last kits they made. It isn't a plane that has a lot of panels to be seen, and these are dealt with the unaccurate method of making the panels stick out, but it doesn't affect the general look. The worst aspect of the kit I would say is the vosp, in the actual it sticks out more, and the starter tube is more prominent, in the kit is nearly flat. As commented, the pilot is laughable, and even myself which I am a model kit maker which nearly never changes a original part, I had to through into the bin of the unusable parts as he was extremely awful. Another negative aspect is the lack of the wing ladder (not the extractable one shown in the original artwork, the built in in the wing) very remarkable aspect of this aircraft and not shown in the original artwork. You need inspiration? you will not leave this kit on the stash for weeks and weeks in a dilemma about camouflage and version, as there is only two versions of this aircraft, as only one example was built. The first, it is the typical that appears on most plates, and the other is the one that had wheel covers on (the kit doesn't include wheel covers). There are floating on the net various illustrations, some varying on the finish of the black wing, but I think it is just an artistic discrepance. Other than that, there are people that paints the propeller brown, grey and black. I've went for black as it looks nicer. It is an interesting kit, of the golden 1930s era of aviation, where records sets and it was a heroic race for constant improvement. In my opinion, it is much better to build and have this kit than the kit of a prototype that never came out of being a design on paper, albeit if circumstances of history made that it never fought. It is a very cheap model to get nowadays on internet, almost impossible on physical commerce. If you have liked this review, we would be grateful if you could click once or twice on the advertising below. Thanks!